Do You Own Your Job or a Business? Are You Working for a Lunatic? Ranch Management Consultants Inc. runs two programs, The Ranching For Profit School and the Executive Link. "When we work for ourselves, we work at what we are good at." Pratt says. We are doing the $10 an hour job. However, we may be leaving the $100,000 per hour job undone. Most ranches are likely losing money. Pratt encourages the audience to subscribe to the Ranching for Profit blog. What letter is most different? We see things through the lens of our expectations. What if the t is a threat? What if you didn't even see it? What if the t is an opportunity? It is a lot easier to see threats and opportunities at your neighbor's operation. Too often, we wait till we are out of time and money to make changes. Join the Texas and Southwestern Cattle Raisers Association for the largest ranching event of the year at the Fort Worth Convention Center, March 23 – 25, 2018. 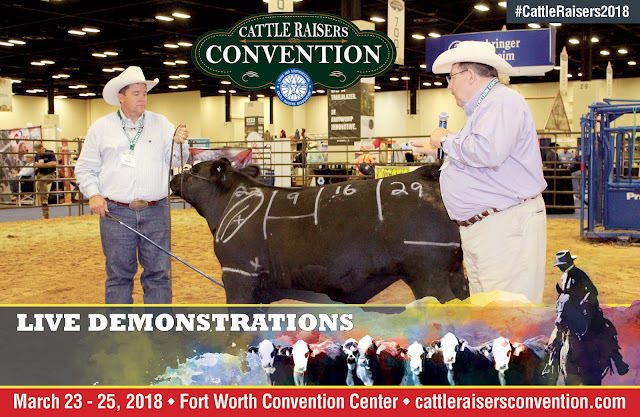 The 2018 Cattle Raisers Convention and Expo brings the best education and information to cattle industry participants. The event is open to all ranchers, landowners and cattle industry participants. You’re guaranteed to walk away with ideas and energy that will have a profound and profitable impact on your ranching operation. To me, being a beef breeder in the 21st century means using every tool on the belt of the cattle industry. The goal? Produce the highest quality, most efficient cattle. Genetics is our biggest asset, because even the best management cannot overcome inferior quality. I will elaborate on the many potentials for higher production and profit through better genetics, record keeping, use of technology, and effective management. Beef-cow herd owners will learn new ways to raise better calves at three University of Missouri meetings in March. The sessions lead producers from proven breeding to new uses of DNA. MU Extension animal scientists David Patterson and Jared Decker will lead the ReproGene Meetings. Management of fixed-time artificial insemination allows more live calves and more uniform calf crops. New DNA tools make rapid advances in beef quality. Genomics allow breeders to predict traits of the next generation. Traditionally, breeders use expected progeny differences (EPDs). Now, new EPDs add DNA data. Pedigrees and production testing are still used; however, genetically-enhanced EPDs give more accuracy. A simple DNA test with blood or hair samples replaces years of production testing. With GE-EPDs, the added DNA speeds improving traits, whether for maternal or meat market ends.